It was a short day’s visit but last month Norwegian Bliss berthed at Southampton on its maiden voyage across the Atlantic from Bremerhaven to New York via San Miguel (Azores) and Halifax, Nova Scotia. She is the latest development of NCL’s mega ships which started with Epic in 2010 and has evolved through Breakaway, Getaway, Escape, Joy for the Chinese market, and now the latest of them, Bliss. 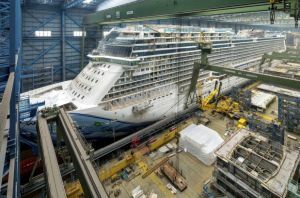 One more, Norwegian Encore, to come, due in November 2019, followed by what we are told will be a revolutionary class, Leonardo, coming in at 140,000 tons, a little smaller than the 168,000 tons Breakaways and even more environmentally friendly. Bliss on average accommodates around 4,000 passengers and even more during the school holiday season, when the stowaway bunk beds come into their own. There are more than 1,700 crew to look after everyone. In the years since Epic, both the Norwegian Cruise Line (NCL) ships and its marketing have evolved. NCL has developed The Haven on the top of the superstructure, a private upmarket enclave, discreetly off limits to the majority of passengers, with its own dining room, spa, private sundecks and, of course, concierge. All the facilities of the ship are of course available to clients in this area. In terms of marketing, “Freestyle Dining” had been introduced before Epic (and now much copied). Norwegian’s eateries have a reputation as ‘best-in-class’ dining. For 2018, Premium All Inclusive was added, offering virtually unlimited drinking facilities, the service charges dealt with and, for suite customers, wi-fi and on-board credit. A full-size electric go-kart track is the latest innovation for NCL, nearly 1,000ft long, twisting around and up and down two decks with 26 cars available. No more than 10 karts are on at one time and it is not supposed to be a race. The cost is $7 for eight laps. This was first introduced on Joy and seems to have been very well received in the Chinese market. Let’s hope they have retained for Encore. Bliss, the line's 16th ship, is earmarked for Alaska late summer and the Caribbean next winter. Southampton has improved immeasurably as a passenger port in recent years, with as many as 10,000 people using a single terminal in one short window with ease. The way passengers are dealt with really puts some airports to shame. And up to five cruise ships can be handled by the port in one single day. Stepping on board for the first time, what was quite apparent was the spaciousness and subdued, one could even say laid-back, decor. While it is a very big ship, finding one’s way around is easy, with plenty of electronic screens and Norwegian continuing with its ‘fish forward’ carpet policy. Follow the design in the corridors if you want to go forward. Norwegian is known for including a myriad of dining options and a vibrant onboard atmosphere fuelled by a multitude of bars and lounges, award-winning youth programmes and more. "Norwegian Bliss is no doubt our most incredible ship to date," noted UK-based vice-president for Europe Nick Wilkinson. "We have elevated Norwegian Bliss's onboard experience to new heights, with the race track and new dining concepts to create the ultimate cruising experience." Wilkinson did a presentation lap at impressive speed. What used to be the Promenade Deck on the traditional ships has now been turned into a series of outdoor diners (weather permitting). It must be wonderful to sit out in the Alaska fiords taking in the views on a long summer’s evening. There is still a four laps-to-the-mile jogging/walking track high up on the ship and quoits and large chess boards have not been forgotten. They are elsewhere. Bliss is essentially a very large self-contained moveable hotel, even bigger than Las Vegas has on offer, with more things to do, mainly at no extra cost. While the captain is in overall command, it is the hotel director who sets the standards and the best of them are ‘hands on’. That it how it is done on Norwegian. Nearly as important is the entertainment manager, with his responsibility including both day and night showbiz activities. Much is focused on children. 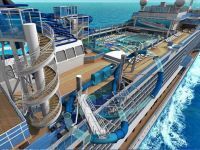 The ship's Aqua Park includes two multi-storey waterslides. The high-speed Ocean Loops free-fall slide includes two loops, one that extends out over the side of the ship and a second see-through loop that stretches down to the deck below. The tandem Aqua Racer slide allows guests to race side-by-side on inner tubes for more than 360ft, with a translucent section that provides stunning ocean views. Junior cruisers can enjoy themselves at the Kids' Aqua Park. An award-winning complimentary youth programme offers age-appropriate supervised activities for children aged three to 12. Teens aged 13 through 17 will enjoy their own space, Entourage, adjacent to the ship's arcade. Tiny cruisers, ages six months to just under three years old, have a dedicated space with the fleet's largest Guppies playroom, where Early Years Coordinators host sensory-play activities for parents and babies. Too much to describe here, and the time available did not even permit a cabin visit, but a mention of some of the tasting delights is mouth-watering. There is the all-new Texas Smokehouse, Los Lobos serving elevated Mexican cuisine and the all-time favourite eatery, Cagney's Steakhouse. Signature à la carte restaurants including French cuisine at Le Bistro; the tastes of Tuscany at La Cucina; the finest fresh seafood at Ocean Blue; global fusion cuisine featuring sushi, dumplings, handhelds and more at Food Republic; Cheeseburgers in Paradise at Jimmy Buffett’s Margaritaville at Sea; handmade cupcakes and macarons at the Bake Shop as well as the brand’s family favourite Japanese hibachi steakhouse, Teppanyaki. There is a limit of $15 per drink with Premium All Inclusive but most will be under the limit at the District Brew House, which serves 24 beers on tap and more than 50 varieties of bottled beers. During her inaugural summer season, Bliss will sail weekly seven-day Alaska cruises each Saturday from Pier 66 in Seattle, where she will be the largest and most innovative ship ever to home-port seasonally on the West Coast. Norwegian Bliss will also feature an incredible line-up of entertainment offerings, including the Tony-Award winner for Best Musical, Jersey Boys. Norwegian was the first cruise line to feature original artwork on its ship's hulls. NCL commissioned Wyland, one of the world's premier marine life artists, to design the exterior of the ship and has come up with a stunning design. In fact there are art pieces throughout the ship, and all the fleet. Perhaps it should be called a foody and art extravaganza at sea. On the technical side, all cruise lines are very aware of their responsibility towards the planet by showing responsibility for the environment. Features on Bliss include an electric pod propulsion drive and improved hydrodynamics, together with many energy-saving systems such as heat recovery and extensive water cleaning arrangements. The exhaust gas from energy-efficient engines is cleaned in a special scrubber system. Much of the daily waste is recycled in an impressive cleaning area deep down in the ship, below the waterline. We said a sorrowful goodbye to Bliss. The North Atlantic held no complications for her. For us, it was the little Red Funnel car ferry to the Isle of Wight. Leave it late and you can often pick up a cruise at a very attractive rate and as it can be the surprise (and cheap) holiday, making it even more enjoyable. Your friendly cruise agent may have some cabins to fill and will be able to offer a variety of land arrangements, or you can go direct to the line, but with not so much flexibility when it comes to the add-ons. The price shown is the starter per person, usually for an inside cabin. Please note these are only a guideline. Celebrity will base Reflection, final ship in the Solstice class, in the Mediterranean this summer with some fine deals still available. This one is back to back to Civitavecchia (Rome) visiting Livorno (Florence/Pisa), Villefranche (Nice), Cagliari (Sardinia). Why not stay in Rome for a few days and buy your flight direct with a budget airline, and that includes BA? Coming in at 125,000 tons, Douglas Ward’s Berlitz Cruising and Cruise Ships rates her at 1493, she carries 3,000 passengers at a client to staff ratio of 2.3:1. CMV is positioning the classic Marco Polo to Cardiff for a series of cruises, with this one taking in Dublin, Cobh, Glengarriff and St Mary’s. CMV prides herself on the on-board lecture programme. Coming in at 22,000 tons, Douglas Ward’s Berlitz Cruising and Cruise Ships rates her at 1067, she carries 848 passengers at a client to staff ratio of 2.3:1. BTN will be reporting on her later in the summer as she travels to Murmansk. Norwegian Cruise Lines has brought back Jade for the summer season out of Southampton after an extensive refit. BTN cruised on her last year (see BTN 4 September 2017). This cruise takes in Le Havre, Bordeaux, Bilbao, La Coruña, Oporto, and Vigo, plus two sea days to relax. Douglas Ward’s Berlitz Cruising and Cruise Ships will have to be updated for 2019 and she comes in at 93,000 tons carries 2,400 passengers and is rated at 1341 at a client to staff ratio of 2.2. SAGA has built up a reputation for its no-children cruises for generally the 50-plus with only chauffeur port transport offered. You cannot self-drive to Dover to join Saga Sapphire. Essentially to Livorno (Florence/Pisa) and back visiting eight ports including Gibraltar. Coming in at 125,000 tons Douglas Ward’s Berlitz Cruising and Cruise Ships rates her at 1443, she carries 706 passengers at a client to staff ratio of 1.7:1. Single cabins are available. TUI is the new name for Thomson and will later this month introduce Marella Explorer which BTN will report on. Spirit of Iberia starts and finishes at Gatwick (flight inclusive) with transfers at Malaga both ways. Marella Spirit visits Porto, Lisbon, Portimao, Cadiz, and finally Gibraltar. Formerly Thomson Spirit, she was once Holland America’s Nieuw Amsterdam. Douglas Ward’s Berlitz Cruising and Cruise Ships seems to have missed her out with the name changes, but she comes in at 33,000 tons carries 1,350 passengers and her sister ship Marella Dream is rated at 1195, at a client to staff ratio of 1.7:1. Spirit carries 706 passengers. Voyages to Antiquity with MV Aegean Odyssey has taken over the lead role for small ship discovery cruises vacated with the loss of Swann Hellenic and Minerva. This cruise flies you to Bordeaux and on to Falmouth, Dartmouth, Honfleur, and London Tilbury. One sea day and single cabin availability. Coming in at 12,000 tons John Ward’s “Cruising & Cruise Ships” rates her at 1284, she carries 408 passengers at a client to staff ration of 1.8:1. Cruise line marketing teams please note BTN features in this piece only operators who send in details. We are happy to hear from you and highlight what you have to offer. For June, we are reporting a ship that would have just come out of a major overhaul and July it is river cruising that is the focus of attention.